The Professional Accessory Kit from Wooden Camera is a professional camera support package designed for the Blackmagic Studio Camera. This kit includes the following: a Fixed Base for holding the rods at the correct lens height, two 15mm Rods (15"), a NATO Handle Kit (Plus, 100mm) that attaches to the top of the camera, a Dovetail Clamp, a Safety Dovetail (12"), a Side Plate Cable Clamp for cable strain relief, and two Side Plates for attaching accessories such as V-Mount and Gold-Mount battery power plates. The Fixed Base for Blackmagic Studio Camera 4K/HD supports optional LWS 15mm rods while providing the correct lens height for use with a matte box. 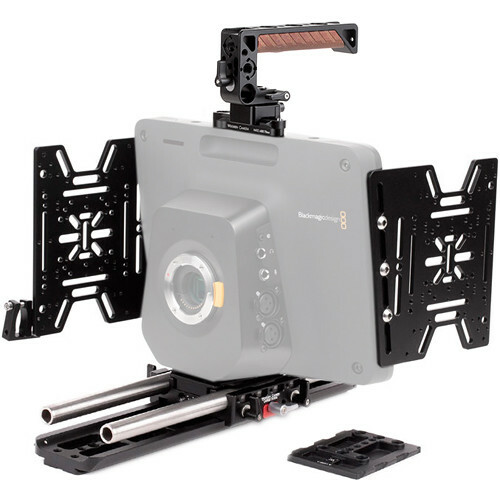 It is designed specifically for the Blackmagic Studio Camera 4K/HD and features 1/4"-20 and 3/8"-16 holes on the sides for attaching accessories and on the bottom for attaching to a tripod or bridgeplate. The Wooden Camera Side Plate for Blackmagic Studio Camera is an accessory plate for the Blackmagic Studio Camera. It attaches to the side of the camera and provides mounting patterns for various devices as well as pass-through slots for 1/4"-20 screws. It can be flipped and reversed in different orientations to attach to the camera in different positions, such as facing in or out. Supported devices include V-Mount plates, QRC style Gold Mount plates, HyperDeck Shuttle, Odyssey 7Q, and wireless audio receivers. A variety of mounting screws is included. The Wooden Camera Side Plate Cable Clamp attaches on the side of the Wooden Camera Side Plate and provides clamping strain relief for up to a few cables (depending on thickness). It can be widened or contracted to support cables of various thicknesses. Two attachment screws are included. This Wooden Camera NATO Handle Kit, consisting of a quick release top handle and 3.9" / 100mm NATO rail, offers a variety of mounting points for attaching viewfinders, focus motors, lights, shock mounts, and other accessories. The handle features a sideways 15mm rod port, 15mm rod opening in front, 19mm rod opening in the rear, shoe mount, and 1/4"-20 and 3/8"-16 mounting threads all around. The sideways 15mm rod port is ideal for attaching Wooden Camera's UVF Mount or other viewfinder mounts. Two 1/4"-20 socket screws are included for binding rods in the front and rear rod openings. The NATO rail can be attached to any two 1/4"-20 threads positioned up to 72mm apart, such as on a cage or select cameras. The handle conveniently slides on and off and secures in place by a lever. A rotating knob on top allows the handle to be adjusted sideways or reversed to the rear by a rosette-like mechanism. The handle features an integrated NATO rail clamp that lets you slide onto any NATO compatible rail, not just the included one. The handle position can be adjusted by loosening the top screw, rotating it into the desired position, and then re-tightening the top screw. This gives you a level of versatility you typically don't find in top handles. The side rod opening lets you attach a 15mm rod perpendicular to your camera, great for attaching an optional monitor/EVF support bracket such as Wooden Camera's UVF Mount v2. A thumbscrew secures the rod in place. A forward facing 15mm rod opening and 19mm rear rod opening are available for attaching optional single rods, which can be used for mounting accessories such as focus motors. A pair of 1/4"-20 set screws are included to secure the rods in place via the threaded holes along the sides of the grip area. A cold shoe built into the top of the handle lets you add on-camera lights, microphone shock mounts, or other shoe mount accessories. 1/4"-20 and 3/8"-16 threaded holes along the grip area of the handle are provided for attaching additional accessories. Two 1/4"-20 thread holes on the front of the handle let you attach an optional 15mm or 19mm rod clamp to the base of the handle. This is a single, 15" long 15mm Support Rod from Wooden Camera for mounting accessories. It is chamfered at each end to ease sliding accessories on and off, and has a hollow interior providing for maximum strength. The Wooden Camera Dovetail Clamp allows you to attach cameras, baseplates, or accessories to an ARRI standard dovetail. It features slots at multiple locations for inserting mounting screws from underneath, and comes with two 3/8"-16 and two 1/4"-20 low profile screws. The 12" Safety Dovetail Plate from Wooden Camera is an ARRI standard dovetail with a stopper screw on one end and a safety latch on the other to prevent accidental camera detachment. It features threaded 1/4-20 and 3/8-16 holes for accessory mounting and tripod attachment. The dovetail can be attached to a shoulder pad for custom handheld configurations. Box Dimensions (LxWxH) 4.8 x 4.3 x 1.4"
Box Dimensions (LxWxH) 8.0 x 7.0 x 0.01"
Box Dimensions (LxWxH) 6.0 x 4.7 x 1.2"
Box Dimensions (LxWxH) 15.0 x 1.0 x 1.0"
Box Dimensions (LxWxH) 4.9 x 3.85 x 1.0"
Box Dimensions (LxWxH) 12.2 x 3.6 x 0.5"